Hong Kong had just one tea garden to date and it was located on Lantau Island near the Mook Yu Mountain, called Ngong Ping Tea Garden. It was owned by a cement maker for over a decade. Thanks to the altitude of 400 metres and the humid air all year round, the tea grew well and could be harvested twice a year. Following a brief history of the tea garden. The tea garden was previously owned by an English lawyer named Brook Bernacchi. In the 1940s he was assigned as the British Queen’s Counselor to Hong Kong. In order to create job opportunities for prisoners who were set free, Brook Bernacchi came up with the idea to open this Tea Garden and let them make their own living. He was born in London and arrived in Hong Kong in 1945 as advisor to Major General FW Festing. “One of Hong Kong’s early democrats, he was an important moderate political voice in the colony from the 1950s to the 1970s”. The only tea plantation of Hong Kong is located in Lantau Island. Chan Woon Chi is the master of tea plantation. He used to be a contractor and took over the plantation. He named it simply the Tea Garden almost 18 years ago. The main products of this tea plantation are green tea and oolong tea. The process of producing oolong tea is complex and time-consuming. Usually, Mr. Chan would choose to produce green tea. 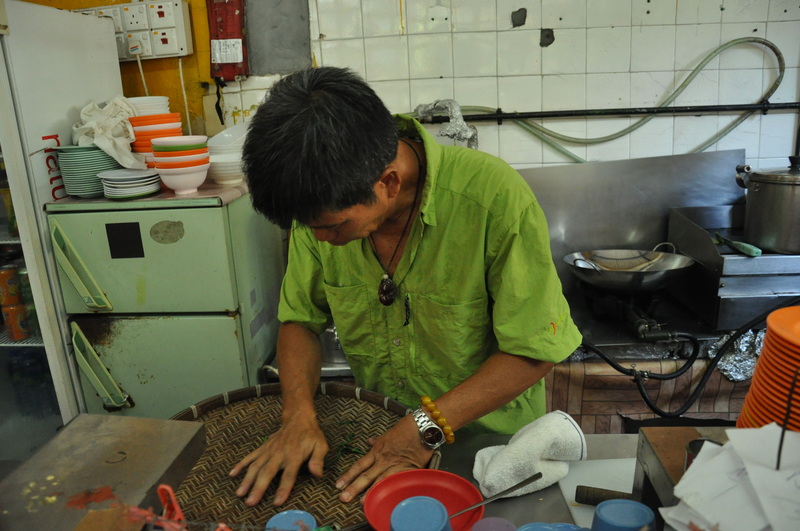 In the morning he picks tea leaves, and then he prepares the tea leaves for several hours. The biggest problem of Mr. Chan is that he does not have enough people to help him. Some of his friends used to come here to help him pick tea leaves, but they are aging. Their children do not want to carry on the planting career. The labor cost of Hong Kong is high. Mr. Chan cannot make a lot of money. Talking about the future of his tea plantation, his biggest wish is keeping the plantation. He makes a plan to promote his tea plantation and restaurant. He wants young people who visit his plantation can experience the process of producing tea. He will teach them how to pick and fire tea leaves. The next generation will experience the charm of traditional tea culture. The Secret Garden. Retrieved from https://aria927.wordpress.com/tea-garden/. Group name EACA – Evangeline, Alfred, Chris, Aria. Ngong Ping Tea Garden. Accessed June 25, 2018. Brook Bernacchi. Retrieved from https://industrialhistoryhk.org/brook-bernacchi-tea-estate-ngong-ping-western-resident-lantau-island/. The Industrial History of Hong Kong Group. This article was first posted on 30th April 2016. 38 timber columns with a height of 8 to 10 metres each symbolises the infinity symbol (8). Why is it there and what is written on them? These columns are located near the Po Lin Bhuddist Monastery, which was established in 1906 by three Chinese monks. At that time it was simply known as “The Big Hut” (大茅蓬 Tai Mao Pung). It changed to its current name in 1924. Each one has a Chinese inscription and originates from a 260-word prayer used by Bhuddists. It is the Heart Sutra. Origin of the Wisdom Path? The sutra’s Sanskrit title, Prajñāpāramitāhṛdaya, can be translated as “The Heart of the Perfection of Wisdom“. The Heart Sūtra is often cited as the best-known and most popular Buddhist scripture. Also known as the Big Buddha, a large bronze statue of Buddha Shakyamuni, constructed started in 1990 and was completed in 1993. It symbolises the harmonious relationship between man and nature, people and faith and is a major centre of Buddhism in Hong Kong. The figure can be seen across the bay from as far away as Macau on a clear day. The Buddha’s right hand is raised, representing the removal of affliction, while the left rests open on his lap in a gesture of generosity. Empty houses on the path to the YHA Ngong Ping SG Davis Youth Hostel, which I booked for 2 days. 1 day was enough to see everything really, but the scenery is beautiful for hiking or a visit to the monastery. These houses are originally from the tea garden and are empty as can be, surrounded by plants and trees they kind of disappear in the background. Yet still visible to many hikers and backpackers as they are close to the main hiking road. No more windows, no more doors, you just walk right in and check it out yourself. Can be a little bit eerie to enter but with a companion it is quite alright. Your blog is very beautiful and the pictures are very nice too!